Situated on an elevated scenic mountainous region in the Western Ghats, Wayanad, with its verdant and misty hills, is a pristine travel destination where one can immerse themselves in its wooded beauty. River Kaberi, a tributary of the Cavery River, is the main river passing through Wayanad. 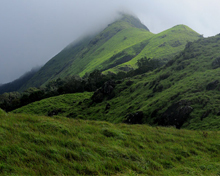 Apart from the lure of the fauna and flora, the other highlights of Wayanad are Chembra, the highest peak in the area, which is located at an altitude of 2100 m above mean sea level and is ideal for trekking, Lakkidi, the gateway to Wayanad that lies atop the Thamarassery Ghat Pass at a height of 700 m, and the perennial fresh water lake Pookot Lake nestling among the evergreen forests and rolling hills. Also known as Muthanga Wildlife Sanctuary, Wayanad wildlife Sanctuary is a biodiversity hotspot with abundant endemic flora and fauna. 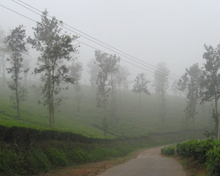 The flora of the Wayanad forest is typical of the Western Ghats. It has more than 100 species of orchids. The cultivation of perennial plantation crops and spices in the higher altitudes spikes the air with the heady smell of coffee, spices and eucalyptus. Established in 1973, the Wayanad Wildlife Sanctuary is contiguous with Nagarhole and Bandipur of Karnataka and Mudumalai of Tamil Nadu. Located in the district of the same name, the lavish bounds of Wayanad sanctuary offer natural habitat to a rich variety of fauna. 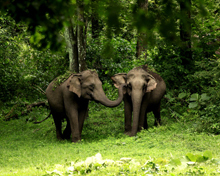 An integral part of the Nilgiri Biosphere Reserve, the sanctuary is home to tigers, Indian bison, elephant, deer, panthers, jungle cats and plenty of bird species including peacocks, cuckoos, owls, babblers and woodpeckers. The nearest airport is in Khozikode, around 100 km away. Different flights are available from other cities in India.